We don't do Valentine's Day really - we have given each other cards over the years and for our first Valentine's Day I think Mani gave me a rose but that's it really. We aren't that fussed and to be honest everything costs a fortune - even the cards. I thought this year I would try my hand at making my own truffles - not to give to Mani necessarily but just to have something sweet to nibble on after supper tomorrow night. They are surprisingly easy to make and oh my gosh they are so delicious. The butter makes them smooth and so soft on the inside. They just melt in your mouth. I rolled some in dessicated coconut, some in ground almonds and others in cocoa. You could have them plain too but I thought fancying them up would be fun. ♥ Finely chop the chocolate and tip into a large bowl. ♥ Put the cream and butter into a saucepan and heat gently until the butter melts. ♥ Remove from heat, then pour over the chocolate. ♥ Stir the chocolate and cream together until you have a smooth mixture. ♥ Cool and chill for at least 4 hours. 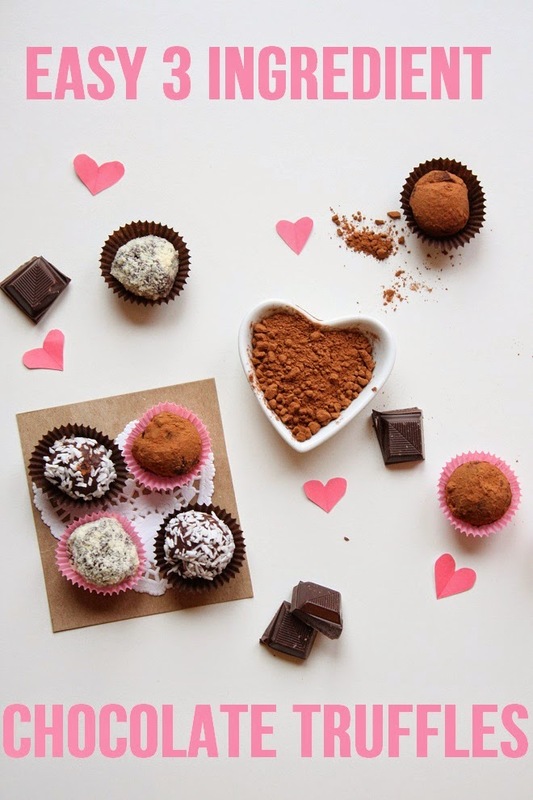 ♥ To shape the truffles, dip a melon baller in hot water and scoop up balls of the mixture and drop onto a plate. ♥ Coat your truffles in your desired flavours or leave them plain and store in an airtight container in the fridge for up to 3 days. Perfect to devour by yourself with a large cup of tea or with your soul mate, on the couch, under a blanket.